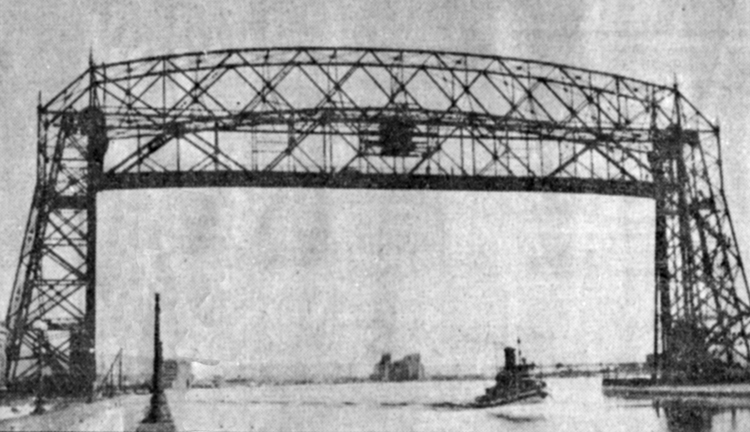 On this day in Duluth in 1930, Duluth’s Aerial Lift Bridge was lifted for the first time to clear the canal so that a vessel could pass through it. The vessel was the U.S. Corps of Engineers’ Essayons, which had been serving the port since 1908. The first large ore carrier to pass under the bridge was the F. E. Taplin, which navigated the canal on April 24 that year. The first automobiles to travel over the bridge’s lowered lift span did so on January 12, and the first trolley car passed over the bridge on March 12. Near the end of April the City Council adopted an extensive set of rules for the bridge’s operation that covered right of way, loitering, warning signals, special consideration for emergency vehicles, how close a car could come to the bridge when it was raised, and others mostly to do with safe operation. Pedestrian rides were strictly forbidden, and violating any of the rules was a misdemeanor punishable by a fine of up to $100 or eighty-five days in jail. The Essayons was later owned by the Zenith Dredge Company before becoming privately owned. It sank in the spring of 2009, vandalized while its owners were attempting to convert it into a bed and breakfast. It remains on the bottom of the bay. Read more about Duluth’s famous aerial bridge here.